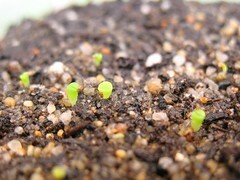 48 days after sowing… I finally see a tiny Pineapple sprout. I Just Gotta Do What I Can! 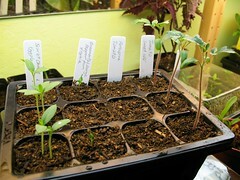 Sometimes I feel like I have so much plant and gardening projects going on, that I don’t have time for it all. For example I’ve been wanting to build up two of the three garden beds in the back yard, but haven’t had the chance to. I still have bolting Swiss Chard and radishes and I have not amended the soil. I just checked the planting chart I have pinned to my wall, and I think I am still okay to plant vegetables for the summer. Maybe I’m just getting anxious with the little time I have after work… or maybe I’m getting discouraged when I see fully grown tomatoes and peppers in the stores, when the one that I planted from seeds are still little… but I just checked mine and they have continued to grow since I took them outside. So maybe I’m just stressing over nothing. 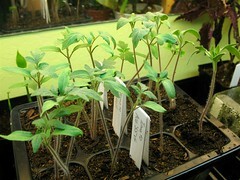 BTW, remember the tomato seedlings that I cut and rooted because they looked like they were dying?.. 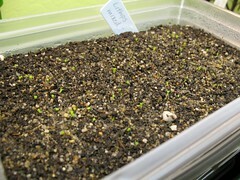 Well, I just check them and they have really bounced back and look much more full of GREEN leaves than the seedlings that I didn’t cut. 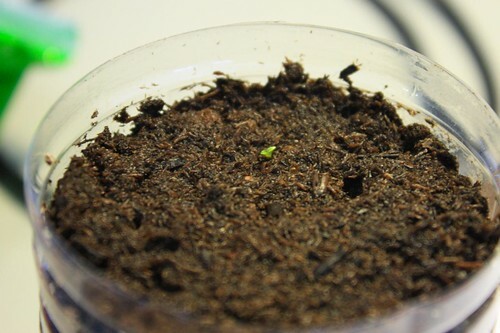 Also, remember the Pineapple we got about a week and a half ago… I placed the Pineapple top in water and it has started to show signs of roots!!! YEAY!